With no senior leaders, Stone and the Indians were going to rely heavily on a core group of juniors and sophomores to continue growing the program. That growth would be integral if they wanted to find any measure of success. The Indians did more than just growth this season. 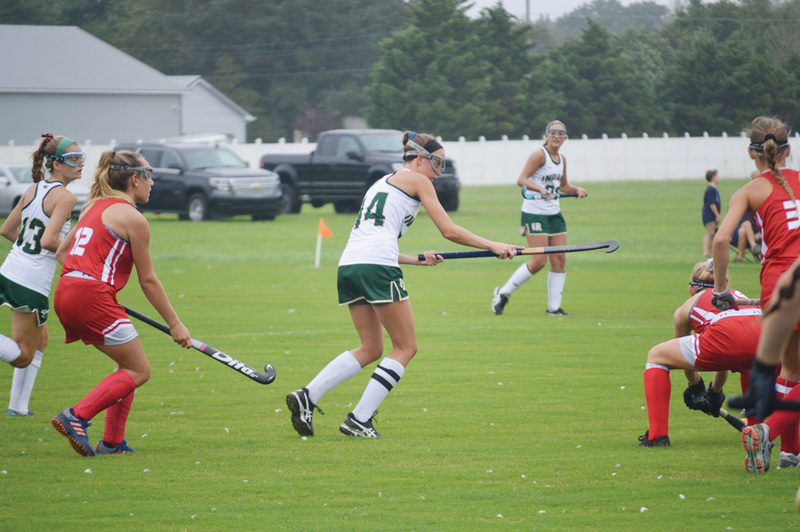 They put the rest of the South Division of the Henlopen Conference on notice that the IR field hockey program is built for success, now and in the future. Following a season-ending 4-1 loss to perennial power Caravel on Saturday, Nov. 10, in the second round of the DIAA Division II state playoffs, Stone and her Indians contingent were disappointed, sure, but they had nothing to hang their heads about. “We upset a team to get here, so we had some momentum coming in,” Stone said after the game. “When you’re invited to the dance, you have to have some of that experience, which, unfortunately, we don’t have that experience, as far as the seniors. IR had plenty of opportunities in the first half but just couldn’t get the ball past Caravel goalie Karli Cauley. The Bucs’ goalie made several impressive saves to keep the Indians off the board and allow the hosts to hold a 2-0 lead. Caravel made it 3-0 just under two minutes into the second half, but the Indians never backed down. Rylie Cordrey ended the Indians’ scoring drought with a laser shot from just inside the circle, to make it 3-1 with 17:11 left in the game, giving IR some hope. However, Caravel responded like the experienced, playoff-tested team they are. The Bucs regained their three-goal advantage at 15:32, cementing what proved to be the final score in the contest. “We had opportunities, and their goalie was fantastic,” Stone offered of the opposition’s cageminder. “They had two great girls in the middle in [Sydney] Keld and [Hailey] Ward, and it was hard to combat that. The Indians finished their season with a 10-6-1 overall mark, which was three wins better than in 2017, when they finished at 7-6-3. Cordrey and junior classmate Avery Congleton led the team in goals scored this season, with 13 each. Freshmen Emma Ruley and Brynn McCabe followed with nine and seven, respectively. Sophomores Kayler Townsend (three) and Jess Rybicki (two) also chipped in with multiple goal-scoring efforts. Congleton and Cordrey led the team in assists as well, with eight and six, respectively. Rybicki followed with five helpers, while Townsend added three. Ruley and McCabe had two assists each as well. As a team, the Indians scored 53 goals on the season, while allowing just 35. As an aside to their scoring efforts, IR was the only team in the state to score on nationally-ranked and undefeated Delmar this season — in a 12-1 loss back on Oct. 4. In the cage, sophomore Allyson Clark has proven herself to be more than ready for the big stage and bright lights of varsity-level competition. Clark posted six shutouts this season while making 97 saves, including a season-high 26 in the game against Delmar. The foundation is in place for the Indians. They have had their taste of the postseason. They’re on the doorstep to the party. Next year, they won’t have to knock to get in. They have the firepower to kick the door down, and everyone they played this year knows it.